The way Vault handles file properties is… interesting. There are good reasons for the way things work, but the mechanics aren't very apparent and first. So let me take some time to go over the concept of File properties. Let's start out with the basics. We'll take a look at a file on disk, no involvement with Vault. This file probably has properties inside of it. If it's a CAD file it has things like Part Number and Author. 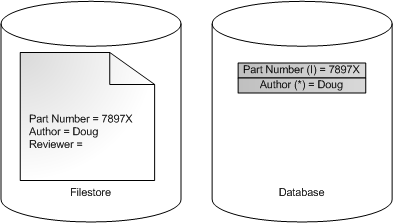 The arrangement of these properties may be different for different file types, but the concept is the same: name / value pairs within the file. Now let's add that file to Vault. 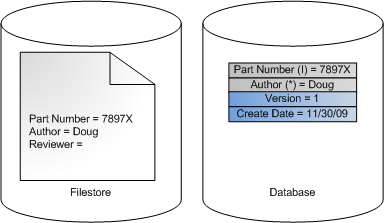 What happens on the server side is that Vault extracts the properties from the file and stores it in the database. There are still properties inside the file, of course. Vault stores a perfect copy of the file on its server. Vault doesn't deal with those properties inside the file, however. 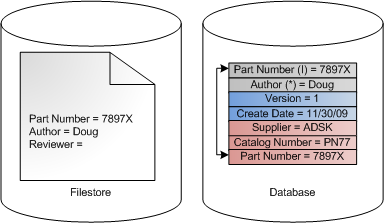 It is much easier to work with the copies in the database. This allows for quick retrieval and searching. The API refers to these properties as Derived Properties because they are just copies from another source. These types of properties cannot be edited since, again, they are meant to be a copy of the file's properties. You need to check out the file, edit it, and check it back in in order to change this property value. The convention is to use the suffix (I), (A) or (*) in the display name for these types. They stand for Inventor, AutoCAD and "other" respectively. The Vault system automatically adds another set of properties related to Vault data, such as the check-in time and who added the file to Vault. The API refers to these types as System Properties. Again these property values cannot be edited directly since the Vault system assigns these values. This type does not show up in base Vault. All other versions have property types that allow the value to be directly edited. These are usually called user defined properties or UDPs. However the API calls these Custom properties. This is the only type that allows values to be edited. It's also the only type that allows property definitions to be added or edited or deleted. It's possible to map a custom property to a derived property. There are various uses for these maps. 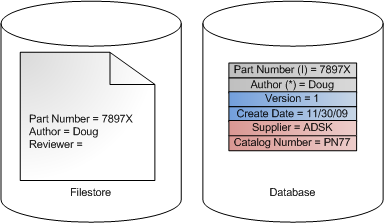 For example, you can assign a value to a custom property then perform a writeback operation, which creates a new version of the file with the updated property value. This is just a first look at file properties. I'll be going into more detail in future postings. If there is something specific you want me to go over, let me know in the comments section below. Update: A better version of the below code has been provied in another article. The new code gets both the error code and any restriction codes. You are probably reading the error code incorrectly. I'm guessing that you are getting it from the Message text of an Exception that gets thrown when you make an API call. Although the Message usually contains the code, it's not the "correct" place to get it. The correct thing to do is catch the SoapException, then check the Details property, which is a bunch of XML data. The Vault error code can be found between the <sl:errorcode> tags. Also, some errors will be accompanied by extra information in the form of a string array, found between the <sl:param> tags. Each parameter will have its own tag and "pid", which is an index value starting at 1. Most errors will not have extra parameters. See the Error Codes page in the API documentation for more information. If you don't get a SoapException, it means that the error is not coming from the Vault server. Something else is causing the error, such as a network error. Restrictions can be thought of as extended error information. In the case of an Exception from the Vault server, there is one and only one error code. Restrictions, however, can have multiple codes. This is useful for complex operations where multiple things can fail at once, and you want to display everything to the user in a single dialog. If the error code is 1092, 1387, or 1633, then you need to examine the restriction information to find out what the problem is. For all other errors, there is no restriction information. Just like with errors, you need to examine the Details XML in the Soap Exception. The Restriction Codes page in the API documentation has more information. Here is the correct way to read the error code. If you are going to AU, you might want to check out some of the Vault classes being offered. Unfortunately I will not be there this year, nor will there be any Vault programming classes. If you attended AU 2008, you can log into the AU website and access a recording of my class Introduction to the Autodesk Vault API. The class number is DE115-2. If you are an Autodesk Developer Network member, you can access a webcast for beginner Vault programmers. The web cast is titled 2008 API session webcast and can be found in the Knowledgebase section of the Vault section on the ADN site. 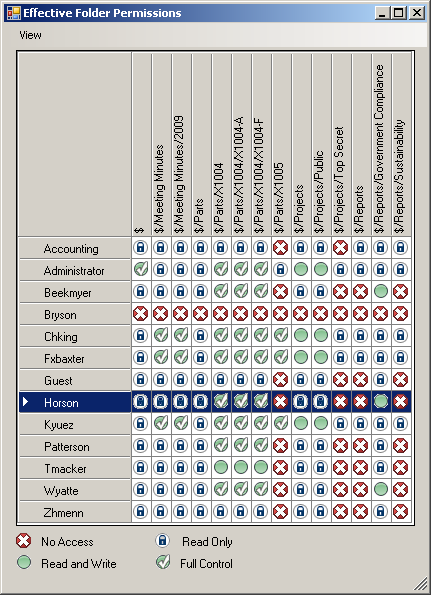 "Effective Folder Permissions" shows a simplified view of each user’s permissions on a set of folders. 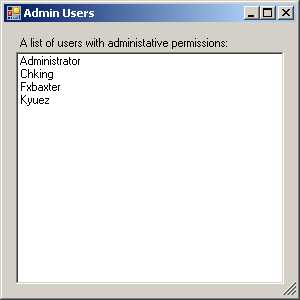 There is also a bonus feature which lists all the users with administrative permissions. Not only am I a programmer, but I’m an administrator of the Vault we use for internal documents. Yes, we do use our own product. So I decided to write a program to make things a bit easier for us admins. It also gave me a chance to put in practice some concepts that I previously went over: The Vault security model and Windows Authentication. The result is a program that runs through all the factors that determine a user’s access level. It takes into account user permissions, ACL information, the ‘Active’ status of the user and whether or not the user has access to the Vault. All group information is taken into account as well. Lastly, I provided a simple list of all the administrators. I recommend that every admin run this check. You never know when somebody might accidently be given admin permissions.